Our story begins with a group of people in a helicopter flying over a desolate Florida town, and we're introduced to four of our main characters: Sarah (Lori Cardille), John (Terry Alexander), McDermott (Jarlath Conroy), and Miguel (Antonè DiLeo). The helicopter sets down so the group can search for any sign life. Humans are the minority now, as the zombie plague seen in the prior two movies has become so bad that one character theorizes that the zombies outnumber the normal humans 400,000 to one. Unable to find any survivors, the group returns to their safe haven, a deep underground military bunker and missile silo. Cooped up in the bunker for months, the sanity of even the strongest group members has begun to fade, with Captain Rhodes (Joe Pilato) becoming the biggest victim of cabin fever. The self-appointed leader of the soldiers in the bunker, Rhodes has become a hot-tempered, over-zealous dictator, obsessed with maintaining his power over the others. His strength among the soldiers is contrasted with Sarah's group of scientists, led by the eccentric Dr. Logan (Richard Liberty), whom the soldiers call "Dr. Frankenstein" behind his back. Logan's madness is not as obvious and volatile as Rhodes's; he's obsessed with the dead and the possibility of controlling them. Logan's guinea pig (Howard Sherman), nicknamed Bub, is slowly re-learning the simplicities of human life in a childlike fashion. Using things like shaving, brushing one's teeth, operating a Walkman, and reading a copy of Stephen King's "Salem's Lot," Logan attempts to see how much the zombies are cognizant of, and his research gives promise in the thought that one day the humans may be able to domesticate zombies, and suppress their desires to feed. Unfortunately for Logan, he's not progressing quickly enough for Rhodes, who demands changes be made while threatening to leave the scientists stranded. As they try to round up more zombies to study, problems ensue and tensions rise. Rhodes and the soldiers revolt against the scientists, while a near-dead Miguel (who'd suffered a nasty bite on the arm while wrangling some zombies for research) unleashes legions of zombies on the bunker as he dies. Will the two groups be wiped out, or will humans prevail again? Day of the Dead was the little horror movie that was never given an ice cube's chance in Hell. From budget disputes that forced drastic script rewrites, to low box office receipts, to bad critical reviews (Leonard Maltin calls it "the least of the trilogy"), it's been building a loyal fanbase during its two decades on home video. It's a shame that in a year that produced such well-received cult classics like The Return of the Living Dead, Fright Night, and Re-Animator, Day of the Dead wasn't as successful as the others. Perhaps it's biggest knock against Day of the Dead is that you really don't want to cheer any of the characters, but that doesn't stop movies like Taxi Driver and The Rules of Attraction from being really great movies. The characters here are all self-centered jerks, but can you blame them? They've been in a cave with a bunch of skin-eating dead people for months, maybe years. If you were in that situation, you'd probably be a little crabby too. What separates Romero's zombie movies from the rest is his relevant social commentaries. Day of the Dead offers two distinct groups, science and the military, and puts them up against each other. As society crumbles around them, they too crumble as the movie progresses. As interesting as this is, the best parts of the movie often revolve around Bub. You'd figure that if you're gonna live around something for an extended period of time, you're gonna study it, and Dr. Logan does just that with Bub and various other zombies. With all of the humans so unappealing, Bub is the most appealing of all. Howard Sherman's performance as Bub is extremely effective, and he doesn't even have any lines. All his acting is done through facial expressions and movements, but he manages to convey emotions in an emotionless mind. Sherman isn't alone though, as Lori Cardille, Terry Alexander, Joe Pilato, and the late Richard Liberty also give stellar performances. Cardille plays Sarah as a stone-faced, tough woman that the horror genre desperately needed. Most horror movies have simpering, whiny heroines that don't do anything until they absolutely have to, but Sarah takes charge and is very vocal about how things go. Alexander was also good, playing the third strong black man in the Dead Trilogy. Like I said in my Dawn of the Dead review, I think it's great that Romero gave prominant roles to black people in such landmark movies. You don't see that too often. The character of John is a much-welcomed character, one who would likes to wax intellectual about the future of humanity and the bigger reasons for the zombie plague. Meanwhile, Pilato's over-the-top acting and his pretentious, overbearing monologues are some of the most memorable parts in the movie, and Liberty gives Dr. Logan a quirky sense of imagination regarding all of his studies. The way he regards Bub is both sweet and patronizing. Actually, the best way Dr. Logan can be described is as demented version of Christopher Lloyd's Doc Brown from Back to the Future. The performances of Pilato and Liberty were so great, their characters are two of my favorite movie characters of all time. The ensemble cast is definitely up to par with the other two parts of the Dead Trilogy. Two other things stand out in the movie. One is where the movie takes place. Filmed outside of Pittsburgh at a storage facility that was once a limestone mine, the claustrophobic atmosphere and the stark, muted colors add a bleaker feel to the movie. Day of the Dead's other stand out is the awesome effects by legendary makeup designer Tom Savini. His past work in movies like Friday The 13th, The Burning, and Dawn of the Dead are nothing compared to what he does here. While the zombies themselves look like crap (thanks to the same blue-grey greasepaint seen in Dawn of the Dead), the sheer viciousness and graphic detail are astounding, as victims are literally torn to pieces on screen. Rivaled only by Rob Bottin's work on John Carpenter's The Thing, Savini's effects here are jaw-dropping, and Day of the Dead serves as the trilogy's high point when it comes to disgusting gore. The common question with an extended movie series is this: "Which one is the best?" Which of the four is the movie that can stand head and shoulders above the others to be the flag bearer of the series? Day of the Dead isn't it. 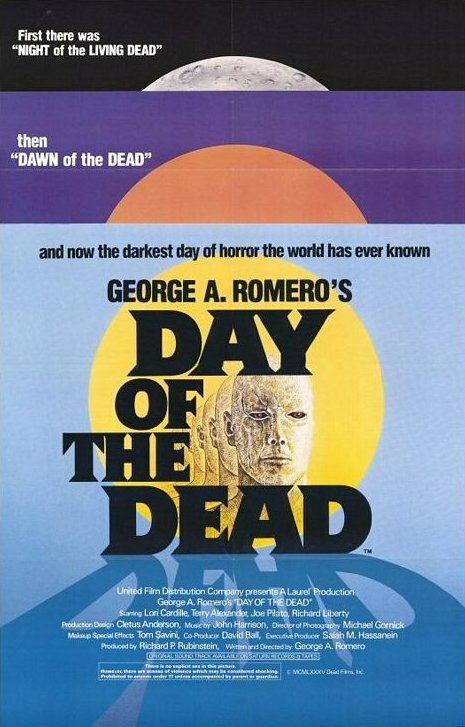 Personally, I'd pick Night of the Living Dead, but Day of the Dead is a very well done movie. And to be honest, it's one of my favorite movies. The four installments of the Dead Quadrilogy are all fine as they are, and I really can't compare them to each other fairly. I could always toss out more compliments, but I don't think I should have to. Four stars.